"No-one in Moldova will officially recognize Crimea as Russian now." Moldovan President Igor Dodon has said at a news conference in Moscow that he is not going to recognise Russia's annexation of Crimea. The Russian news agency quoted him as saying that no-one in Moldova will officially recognise Crimea as Russian because Chisinau seeks to build friendly ties with Ukraine and settle the Dniester problem. "I have not changed my position and will not change it. But we should understand that we need to build friendly ties with Ukraine, we need to settle the Dniester problem. I don't think anyone in Moldova would risk officially recognising any such thing," he said. 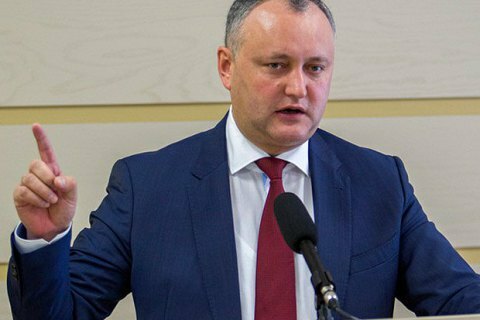 Earlier, Dodon said that if his Party of Socialists wins the next parliamentary election in Moldova, he will move to cancel the association agreement with the EU. During his election campaign, Dodon described Crimea as Russian.